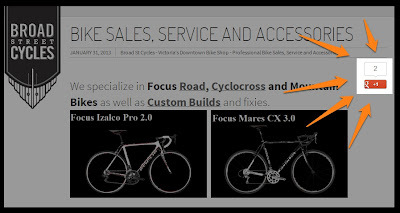 Our good friends and long-time sponsor, Broad Street Cycles, has recently launched a new website and we need your help to kick start their page ranking. 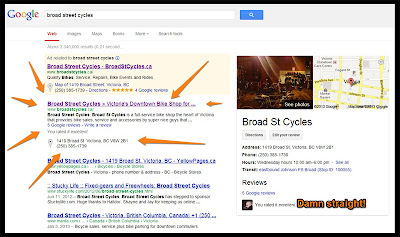 They have made it really easy for you: all ya gotta do is visit http://www.broadstcycles.ca/ and click on the Google + buttons to the right of the posts. If you're feeling particularly intrepid, check out their Google place page and leave a quick review. Thanks everyone! Stay tuned later this week for news about the upcoming Black Metal Alleycat, Harbour Road Sprints and the long-anticipated Stuckylife t-shirt brought to you from the dark mind of En Noir (aka Crow Campbell).